Aunt Marianne Labuche will be the next bronze sculpture. She was Prairie Du Chien's first Physician. She rescued and nursed her granddaughter, baby Louise Gagnier who had been scalped and left for dead. Photo is small replica. Dedicated in 2013, the Mississippi River Sculpture Park Shelter will provide families and friends to gather, share a meal, and imagine the possibilities. 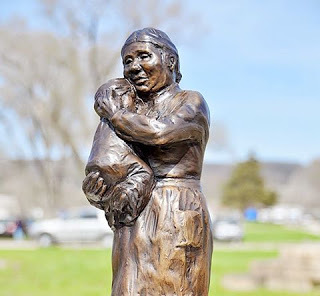 The life sized clay sculpture of Aunt Marianne LaBuche has been taken to the bronze foundry in Milwaukee. The photo left, shows the sculpture torso which has been covered with the silicon rubber mold material. The bumps embedded in the mold are there to register with the plaster backing which will be applied in sections to keep the mold firm. When this is done and all sections are complete they will be removed from the clay model and the sections will be ready for receiving the sculpture wax. The sculpture wax will be melted and poured into the mold sections to be about 3/4 inches thick. These wax pieces will then be attached to sprues (wax sticks) and mounted on a board. Then the wax section assembly will be turned upside down and dipped into a ceramic slurry and dried several times. When the ceramic slurry is dry with the wax inside, this will be put into a kiln where the wax will melt out and leave the mold ready to receive the bronze. While the ceramic mold is in the kiln the bronze will be melting in a crucible to about 2100 degrees Fahrenheit. When the mold is ready, still hot, and the wax is gone it will be taken out and put upside down in a bed of sand ready to have the molten bronze poured into the space where the wax had been. This process will be followed for each section of the original mold. Then when all of the pieces have been cast they will be cleaned and welded together using the same type of bronze for welding rod. When the whole sculpture is welded together it will be cleaned and the patina (color) will be applied. The color is done with different chemicals sprayed on to the bronze when the finished sculpture is warm and a final wax finish is applied to help preserve the color. The whole process takes months to complete and each sculpture is one-of-a-kind.